Tune into this webinar to get an 18-minute introduction to creating standalone applications using COMSOL Compiler™. COMSOL Compiler™ gives specialists the freedom to share knowledge and expertise in the form of modeling and simulation applications with anyone in the world. 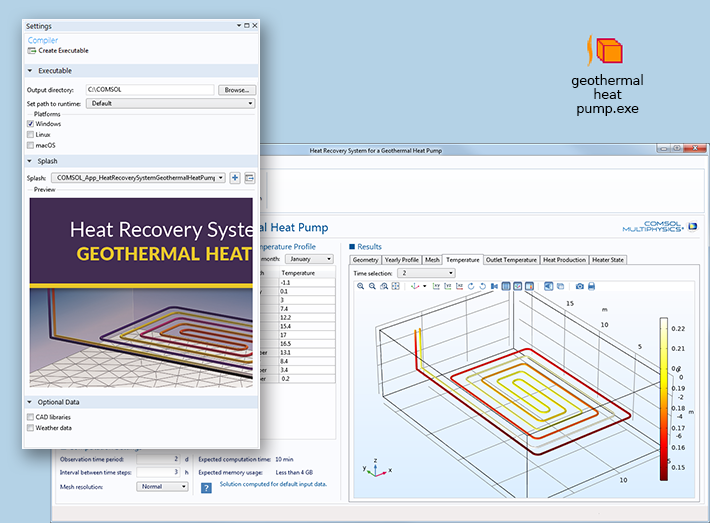 It allows users to create standalone applications for unlimited use and distribution that can run without the COMSOL Multiphysics® software or a COMSOL Server™ license. In this webinar, we will discuss COMSOL Compiler™ and demonstrate how to compile a simulation application into a single executable file. Log in or sign up to register. A COMSOL Access account is required to attend Creating Standalone Simulation Applications with COMSOL Compiler™ Webinar. COMSOL Ltd. James Gaffney works at COMSOL as an applications engineer for acoustics. He studied acoustical engineering at the University of Southampton, where he also earned his doctorate degree. His research involved predicting the fuselage installation effects from engine fan tones with analytical methods.